Under the administration of the incontinently mendacious President Donald J. Trump, everyone should worry about the integrity of America’s official statistics. They should worry about much more under Trump, particularly the fate of democracy in the United States. But without credible official data, there can be no genuine accountability—and thus no democracy. Commentators on the right like to quote Ronald Reagan’s 1988 claim  that in the war on poverty, declared  by Lyndon B. Johnson in 1964, poverty won. That claim, perennially used as a cudgel to beat the social safety net that was expanded under Johnson’s ‘Great Society’ reforms, is consistent with official poverty estimates, the methodology of which has not been updated since the 1960s. Because that methodology ignores taxes (including the earned income tax credit) and programs like food stamps (now called the Supplemental Nutrition Assistance Program, or SNAP), their effects are not counted, no matter how successful they are in reducing want. Such a widely acknowledged statistical flaw invites commentators to fill the hole with their prejudices, as Reagan did. More recently, Trump’s Council of Economic Advisers, in a July report  arguing for work requirements to be attached to social benefits, claimed that, thanks to the American safety net, the war on poverty ‘is largely over and is a success’. This argument hinges on abandoning traditional metrics, which measure income, and switching to consumption. Consumption is arguably (but only arguably) superior to income as a welfare measure, but it is unclear how many of the very poor participate in a burdensome and intrusive survey that has a 40% non-response rate. More worrying still is the essentially arbitrary ‘correction’ to the consumer price index (CPI) that reduces the poverty line so that there are fewer people beneath it. Perhaps the official CPI doesn’t adequately capture quality improvements in goods and services. The consequences of this have been addressed in the scholarly literature, notably by a National Academy of Sciences panel that argued against a mechanical correction. But debating that issue is very different from abandoning the official CPI in favor of a more politically advantageous one that comes close to eliminating poverty. A more egregious case of data manipulation concerns a report by the United Nations Special Rapporteur on extreme poverty and human rights. At the invitation of the US government, the Special Rapporteur, Philip Alston, examined extreme poverty in the US. He reported his findings  to the UN Human Rights Council in June 2018. The result makes for dreadful reading. Documenting the extraordinary depths of poverty in parts of the US, the report includes tent camps on the streets of Los Angeles, yards awash in untreated sewage because local authorities refuse to supply services, and the widespread use of fines and confiscations levied on poor people that many towns and cities are using to finance themselves. 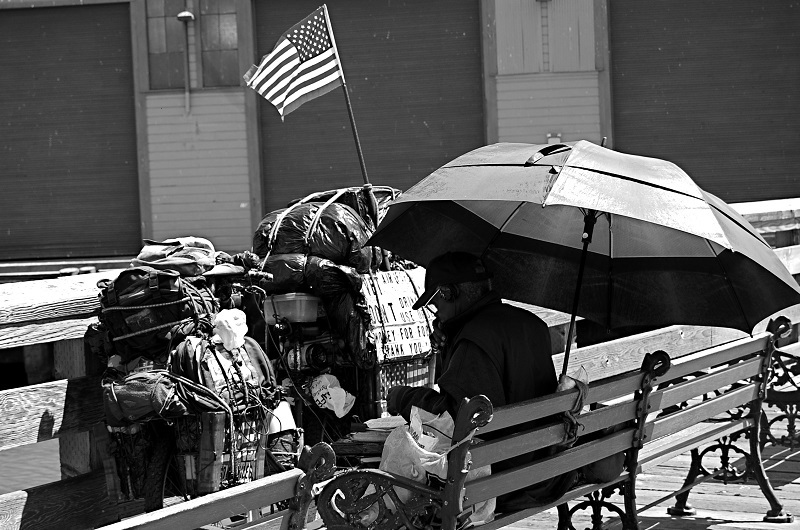 Whereas Johnson declared a war on poverty, parts of America are now waging a war on the poor. Many of us believe that, because the US social safety net is so imperfect, extreme poverty is more prevalent there than elsewhere—and certainly among developed countries. Welfare reform that encouraged work has been good for some of the poor, but bad for the poorest, expanding inequality within the poor population and hurting the worst off. Books by Kathryn J. Edin and H. Luke Shaefer  and by Matthew Desmond  have documented in detail the miseries of life at the bottom in America, and Shaefer and Edin argue that several million children in the US are living on less than two dollars a day. In a New York Times commentary  in January, I noted that the World Bank now publishes estimates of global poverty that include the rich countries, and that those estimates show 5.3 million people in the US living on less than the equivalent of the world’s global poverty line. In my argument, I used US$4 per person per day for rich countries as roughly equivalent to the global poverty line of US$2 used for poor countries. There are more ‘globally poor’ people in the US than in Sierra Leone or Nepal, and the poverty rates in the US and China are similar, despite the more than threefold difference in per capita income. The World Bank’s calculations that I reported were widely denounced—by both the right and the left. The Heritage Foundation argues  that if one uses consumption, not income, there are only 250,000 globally poor people in the US. Never mind whether the parents selling their children’s social security numbers to survive, or risking their children’s safety to find a place to live, have time to participate in the consumption survey. Many on the left, meanwhile, refuse to believe that any American is as poor as the poorest in Africa or Asia. Whereas the right wants to decrease domestic transfers, the left wants to increase foreign transfers. The story then turns surreal. Alston’s report drew an angry rebuke from the US ambassador to the UN, Nikki Haley, who claimed  that ‘it is patently ridiculous for the United Nations to examine poverty in America’, and an official US response  saying that Alston’s numbers were wrong. Yet the only numbers Alston used came from the US Census Bureau, an estimate described in the response as ‘the exaggerated figure cited by the Special Rapporteur’. The response then approvingly cited the Heritage calculations, which are based on my $4-per-day poverty line. And then, perhaps only coincidentally, the Trump administration pulled the US out of the Human Rights Council, with the result that Haley didn’t attend the report’s presentation. She, like the Council of Economic Advisers, noted that the Trump administration knows how to tackle deep poverty, which is to force people to work. That may or may not be true, but denouncing the Census Bureau’s estimates in favor of those from the Heritage Foundation (there is evidence  that agency officials objected) or conveniently tampering with the CPI, and then treating the alternative numbers as superior to the official statistics, is surely well beyond the pale. Trump’s administration showed in 2018 that it will admit no blemishes, whether extreme poverty or the unconscionable death toll following Hurricane Maria in Puerto Rico. And there is no reason to believe that further distortions of the truth, and the threat to democracy that such behaviour implies, will not appear in the coming year. Angus Deaton, the 2015 Nobel laureate in economics, is Professor of Economics and International Affairs Emeritus at Princeton University’s Woodrow Wilson School of Public and International Affairs. He is the author of The great escape: health, wealth, and the origins of inequality. This article is presented in partnership with Project Syndicate © 2018. Image courtesy of Irony2187 on Deviant Art.